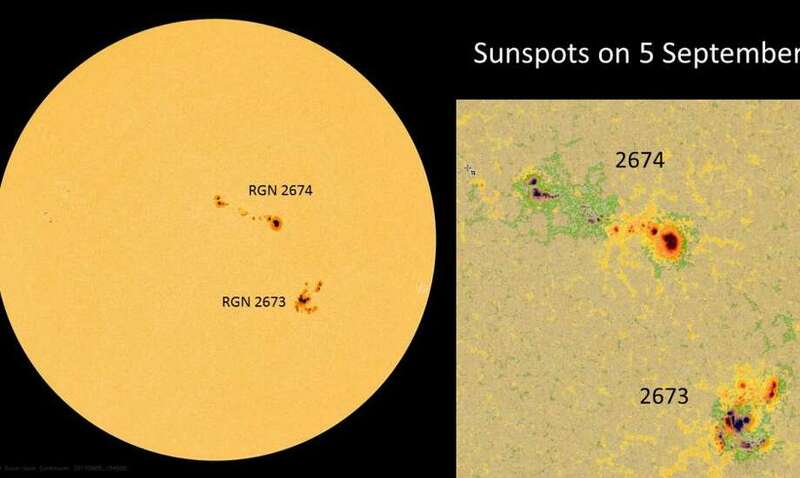 Two large sunspot groups visible on the disk of the sun Sept. 5, 2017. The beautiful thing about a solar flare that ruptures a filament of the sun's magnetic field and fires plasma into space — a coronal mass ejection — is that when it hits Earth, we get expanded northern lights or aurora. If the ejection is big enough, and hits the Earth just right, you can spot aurora much farther south than usual. NOAA provides a very informative caveat to its projections: "This probability forecast is based on current solar wind conditions measured at L1, but using a fixed 30-minute delay time between L1 and Earth. A 30-minute delay corresponds to approximately 800 km/s solar wind speed as might be encountered during geomagnetic storming conditions. In reality, delay times vary from less than 30 minutes to an hour or so for average solar wind conditions."